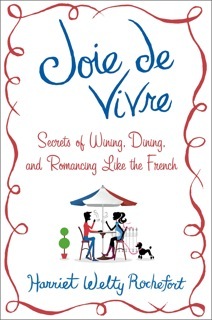 (Part one) Harriet Welty Rochefort‘s latest book, Joie de Vivre: Secrets of Wining, Dining, and Romancing Like the French, investigates the French way of enjoying life. It is preceded by two light-hearted but informative books, French Toast, and French Fried, and completes a trilogy about her adopted country’s charms and foibles in a breezy, exuberant style, and with genuine affection for the inhabitants of her adopted country. French Impressions: Harriet Welty Rochefort’s Joie de Vivre taking pleasure in the small things (part one) shares what inspires her writing with a slightly sassy look at her life in France. AWP: In Joie de Vivre, you’ve described yourself when you first arrived in Paris as an American girl: independent, free-spirited, carefree, spontaneous, and with a big smile. Was it hard, being so isolated within the French culture, to write? HWR: I wasn’t really isolated, I was simply different. I was warmly accepted by my French family and my French husband always encouraged me to express myself in my writing even when I said things about the French that were not always complimentary (but then he’s French and criticism doesn’t bother him). By the way, the whole area of how the French view criticism (in a positive light) and how the Americans do (in a negative one) could be a book in itself. AWP: As an American married to a Frenchman and living in France for four decades, how did you grapple with the cultural differences? Can you share the moment you knew it had changed? HWR: In the beginning years I was mystified and sometimes miffed when I didn’t understand what was going on, either because of the language or social codes. As time went on, I didn’t keep a journal but I wrote down the specific incidents, which showed that there was a true yawning cultural gap, and those reflections became French Toast. I have to say that my three books have helped me immensely and that I have come to appreciate and value French culture in a way I did not before exploring and investigating many facets of it in a thorough manner. An example: French schools, to put it mildly, do not welcome parents in the classroom (or even inside the door once the bell has rung). I truly thought my children were being tortured (well, not really, but I could not for the life of me figure out what was going on at their school) until the day I wrote a chapter on French education. I asked the principal if I could attend a class. First surprise: he said he would have to ask permission from the teacher! When he got it, I was welcomed into a 4th grade class where I was astounded by the teacher’s creativity and calm and by how well behaved the students were. The scene was so totally different than what I’d imagined and it taught me a lesson: if there’s a mystery surrounding a cultural difference that seems unfathomable, it’s important to be active and with an open mind attempt to find out what’s happening. The French have their own ways of doing things. It’s up to us to adjust to them, not the opposite. AWP: How did you become, in your words, a “little bit” French? HWR: I still speak French fluently but with an American accent, and as my French husband says (and I appreciate his judgment) “you know a lot about French culture.” I did indeed make a conscious effort to understand the French and it has paid off. I now laugh at jokes that would have turned me off; I understand why French women make the effort to look good; I make an effort not just to produce a savory meal but I now set a pretty table (something I neglected to do before, surely to my dear mother-in-law’s horror); when I dress I pay more attention to perfume and accessories than anything else. I truly have been affected by and appreciate the love of aesthetics that permeates life here. Oh yes, and I can now almost shrug and argue the way the French do! AWP: What French cultural nuances, attitudes, ideas or habits have you adopted? In which areas have you embraced a similar aesthetic? HWR: Although the French have a reputation for being “rude,” they can also be incredibly polite and subtle. In France, saving face is as important as it is in Japan. I’ve tried to adopt the French way of being polite when I can by not asking direct questions that would put a person on the spot. I’ve not yet managed to attain their heights of subtlety. The non-dit, the unspoken, is much more a factor in France than it is in the States where we like to lay things on the table and get people on the same page. In France, if you make things too clear, it’s obvious that you think your interlocutor is stupid! AWP: Parisiennes dress well all of the time. How do you describe their understated elegance? HWR: I’d qualify the above statement by saying that the Parisiennes we foreigners think about and see in the historic center of Paris and other affluent areas dress well all the time. The understated elegance of these Parisiennes comes from accenting one feature but not another, making up the eyes or the mouth but not both, and choosing one spectacular piece of jewelry or a fabulous scarf as an accessory. They aren’t too made up and their hair generally is natural. One day, for fun, I compared the hairstyles and make-up of anchors on French TV and American TV–try it, and you’ll see the difference. “Natural elegance” seems to be the byword for la Parisienne. AWP: What is the most valuable thing the Frenchwoman has to work with? HWR: Self-confidence. I’ve seen many Frenchwomen who are far from classically beautiful but who deflect attention from a weak point (prominent nose, not perfect teeth) to accentuate a strong one (beautiful hair, complexion). They know what to do with what they’ve got. AWP: How has the idea of the Parisienne changed since you began writing? HWR: I don’t think the idea of the Parisienne will ever change. She’s part-myth, part permanent fixture. She’s still very much around, both as an idea and in the flesh. AWP: I love your statement: “When you know that the street is a place you get looked at, you dress for the street and get into the “looking” game. What’s your style? HWR: My style is simple. I wear basic black for several reasons: black goes well with the grey skies in Paris, black doesn’t get dirty, black can be dressed up or dressed down, black is a perfect background for a gorgeous colored scarf or beautiful earrings or a pin. Black is also great because most Paris apartments are small and there are only so many clothes you can have. One or two basic black outfits don’t take up much closet space. Bravo, black! AWP: How do you define style? HWR: Being discriminating and wearing what’s appropriate to the place you’re going and the people you’ll be with. AWP: Was being stylish important to you growing up? HWR: Even in the small town I grew up in, the stylish women stood out. My mother was stylish because she practiced the art of discrimination and the idea of less is more. She also stood out because she was reserved. People would always say to me: “Your mother is so lovely, so reserved” in an admiring way but you could see that they were also intrigued. She taught me that it’s important not to say everything you think, not to automatically “deliver” yourself to others. French women are like that. Without knowing it, my American mother embodied French class and style. HWR: Knowing I can hop on the metro (buses are too slow for me) and go to any different area of town, find a café, and watch very different people depending on the neighborhood. We lived for 24 years in the upscale 16th and Neuilly and then moved to a garden apartment in the 20th when our sons left home. I also lived in the 5th, the 7th, and the 15th. Unlike my friends in the Latin Quarter who are horrified by the idea of leaving it even for an afternoon, I take the metro almost daily to go to a new spot and soak up the atmosphere. I’ve always got my head in the air studying the various buildings and the architecture. Paris is a living, breathing history lesson. AWP: In Joie de Vivre, you write about the French dinner party: ritual, food, scintillating conversation. What are dinner parties like for you? AWP: What is typical French dinner party dialogue? HWR: Art, music, the latest exhibition, vacation, politics, but never the stock market or religion. Another thing about French dinner party dialogue: it moves quickly from one subject to the next. That way no one gets bored. AWP: The Sunday French meal: the fundamental human ritual of sharing food around a family table. What is this like? Exhilarating? Excruciating? HWR: In the beginning, I found the Sunday French meal rather excruciating. I didn’t know how to pace myself. I didn’t realize that this was the foundation of French family life, that eating is not a pit stop before going on to do something else, but that gathering around the table is the cornerstone, the anchor, the event. I must have had thousands of French Sunday meals and they are carved into my memory as precious moments with both the older and the younger generations. The fact that French children can sit at the table so long and eat everything that is served is a tribute to French child-raising. My French grandchildren eat everything from raw Camembert to mussels without blinking an eye. And they are welcome at the table, but never to monopolize conversation. AWP: Tell me about your cooking and eating habits and traditions. AWR: From my mother-in-law, I learned to “cook French.” She let me help her in the kitchen, and showed me how she did certain dishes (she never used a recipe book–she didn’t have any). It was like having a personal French cooking course for 40 years! So now I cook French the way she does, and love the way the French rejoice in sitting down to even the simplest of meals. A great French chef said that you can have the best recipes in the world but if your products aren’t the best, it’s to no avail. I’m lucky to live in a neighborhood in which we’ve got fish shops and butcher shops plus wonderful bakeries (the famous “Gana” baguette was invented by Ganachaud just up the rue des Pyrenées), and fruit and vegetable shops. When our children were in school, they liked to come home for lunch, which would consist of a starter (maybe a fresh avocado with vinaigrette), meat or fish and vegetables, cheese, and dessert. No sandwiches in our house! AWP: What was your most memorable meal to date? HWR: I’ve had many memorable meals. One was at the Pré-Catalan in the Bois de Boulogne where Philippe invited me to celebrate my obtaining French nationality in 1996. The food and wine and service were superb and the snow falling in the woods outside the restaurant gave the meal a magical feel. Another memorable meal was sheer serendipity. We’d stopped at an inn near Omaha Beach where the owner recommended a restaurant in a nearby village. We reserved, then strolled around the little town, and returned to find a lively scene. Families were gathered around tables covered with white linen tablecloths and decorated with a bouquet of flowers. There were babies and young couples and grandparents, all looking supremely happy. The servers were cheerful and the seafood plate out of this world; I still can taste the briny smell and quality of the oysters. I liked the restaurant because it was obviously for the locals and simple and unpretentious. AWP: The French, particularly Parisians, have two places, two lives. What is this love of a second place? HWR: The French have three million second homes, twelve times as many as the Germans, and more than anyone else in the world. This dates back to the ancient régime when nobles had a private home in Paris in addition to their property in their native province. Parisians especially like to have two lives, a busy city one, and a more relaxed one in the country, in the mountains, or by the seaside. We have a rather special set-up: our second place is an apartment in a castle in the west of France. Going from a garden apartment in the slowly gentrifying but populaire 20th arrondissement of Paris to a 16th century castle in a quiet lovely area of salt marshes not far from the sea gives us two entirely different lives. AWP: What is the latest book you read? Would you recommend it? HWR: Billy Lynn’s Long Halftime Walk by Ben Fountain. It’s a fine-tuned, lucid, and sometimes very funny tale that shows the disconnect between the people back home and the soldiers who go to war. One of the best line in the book is “Somewhere along the way America became a giant shopping mall attached to a country.” I definitely recommend it. HWR: My Paris consists of many gardens. First, there’s our own, a rarity in Paris. Of course there are the Luxembourg Gardens, but closer to where I live there are the hilly Buttes Chaumont and the vast Bois de Vincennes. When we lived in Neuilly, I walked in the Bois de Boulogne and the Jardin de Bagatelle. I also love the 17th century Jardin du Palais Royal with its arcades and the contrasting and controversial black and white striped columns installed by Daniel Buren in 1966. From where I live I can take a brisk 30-minute walk to the Place des Vosges to admire the symmetry of the 17th century hotels particuliers surrounding it. What I love in Paris is that you can walk to so many places: from our apartment I walk to the pharmacy, the grocery store, the optician, the butcher stores, the boulangeries, the hairdresser, the bank. I hardly ever take the car anymore, which is a good thing since Delanoe, the Mayor of Paris, has made it so difficult to drive and park. Since I’m a “lifer” in Paris, my Paris also consists of family: my mother-in-law is in a retirement home in Neuilly; our son and his wife live in Boulogne with their 3-year-old; my sister-in-law lives in the 15th, and our friends are scattered all over the city. Since I eat French food all the time, for a change I go to the rue St. Anne when I get the urge for Japanese fare or to Chinatown for Chinese food. I may live here permanently but I’m a perpetual tourist in my adopted city. I love nothing more than hanging out in cafés watching people and usually time my food shopping for a stop in a café with a newspaper. HWR: There are so many hidden parts of Paris. It’s great to go to the known sites: Notre Dame, the Arch of Triumph, the Louvre…But once you’ve done all that, the best thing, the most Parisian thing you can do in Paris is to wander. I have a French friend who tosses a coin on top of a map of the city. Wherever it lands will be his walking destination for that day. This is a city where you can walk and walk and still discover something new each time. HWR: An e-book version of my second book, French Fried, and a fiction project. Lots of pain sur la planche, as the French expression goes. Harriet Welty Rochefort grew up in Shenandoah, Iowa. She is an author, freelance journalist, speaker, former professor of journalism at the Institut d’Etudes Politiques de Paris (Sciences Po) and longtime resident of France. 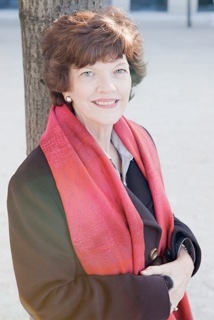 As a freelance journalist in Paris, Harriet has contributed articles on French business and lifestyle to major newspapers and magazines including Time, the International Herald Tribune, and to specialized publications on France. She regularly speaks about Franco-American cultural differences to various university study programs and other groups. She is a member of the Anglo-American Press Association in Paris, the Author’s Guild, and PEN. 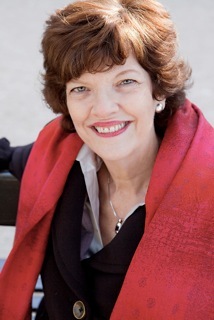 Harriet’s books reflect her fascination with the French and the cultural differences between the French and Americans. Her first book, French Toast, is a humorous account of what it’s like to be an American in a French family, honing in on all the things she can’t figure out, whether it’s the French educational system or how French women manage to look so terrific with seemingly little effort. Her second book, French Fried, describes the culinary capers of an American in Paris. She tells how, thanks to her French mother-in-law’s tips, her cooking evolved from opening a can of peas to casually slinging out four-course meals as a matter of routine—in a tiny French kitchen. Along the way, she explores the wonderful world of French cuisine, touring cheese and wine cellars and lands a hard-to-come-by invitation to a Champagne tasting for professional sommeliers at the Ritz. You may also enjoy A Woman’s Paris® post, What’s in a Word? There’s more to French class than you thought. Jacqueline Bucar, French teacher and immigration attorney, invites us to stimulate a way of thinking and learning that expands our understanding of the world and ourselves through the study of a foreign language. She shares “what’s in a word,” a way of thinking, a “mentality” that helps define the people who speak it and their culture. A behind-the-scenes look at French parenting, by au pair Alyssa Glawe who asks, “How do the French have such polite and courteous children without lifting a finger?” For Alyssa, every day leads to new cultural shocks and humorous situations. Paris photo shoot – in search of the perfect Moroccan slipper, by writer Lisa Rounds who tells of her adventures in the North African neighborhood of Barbès in Paris searching for the perfect slipper in red, of course, for a Cosmo photo shoot. Lisa shares her story of “living the dream,” working for a publishing company in Paris. Merci je viens de lire et de parcourir ton manuscrit et je l’ai trouvé très approprié; cela correspond à ma culture française; au fait, comme toi j’ai deux cultures. Je suis Marquisienne et comme les Marquises sont françaises, forcément il a fallu s’immerger dans les deux et je m’y trouve très bien; j’ai beaucoup apprécié ton approche sur les repas familiaux qui sont le fondement et la pierre angulaire de la vie familiale. Contrairement aux Métropolitains, nous les îliens, nous vivons plus dans l’instant présent, nous ne connaissons pas le mot “stress”en tous les cas nous ne les vivons pas comme eux. Et la couleur noire est à bannir dans nos journées de travail, c’est triste!! Voilà, je voulais apporter un petit partage et merci encore. Merci beaucoup, Fina Verdet, pour vos remarques : je suis fière d’être lue aux Marquises. Il est intéressant de voir que même à l’intérieur de la culture française il y a de grandes différences. Le “stress” est pour les parisiens mais pas pour les îliens, comme vous le soulignez. Votre message me donne surtout l’envie de connaître cette partie du monde que je ne connais pas et qui parait merveilleuse. Vous avez de la chance! Wonderful interview! Having lived in Paris, married to a Frenchman for 4 years, Harriet articulates so well all the subtleties of French culture that foreigners often struggle to comprehend. I have shared this with my readers who will love the book. Thanks to Sally Asher for her kind remarks and for sharing this interview with her readers. I’m glad it struck a chord and might help people better fathom, figure out, and appreciate the French! Fabulous interview w/ so many interesting points of discussion. I teach French to adults at a local senior college. I recommended Joie de Vivre to them when it first came out but I’m sending them the link to this interview. A picture says a thousand words and this interview does just that, painting an insightful picture of French culture. Thank you for your comment and for sharing the interviews, part one and part two, with your students. We are grateful to Harriet for sharing her experiences and insights into French culture with candor and humor. An exceptional woman in all respects. Leave a reply on "French Impressions: Harriet Welty Rochefort’s “Joie de Vivre” comes when you least expect it (part two)"